State Superintendent Janet Barresi attended a ceremony Thursday at which funds were given to refurbish homes for teachers, school support staff and others displaced by recent. 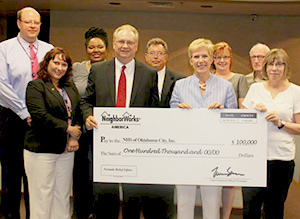 Neighborworks America presented Neighborhood Housing Services Oklahoma City, Inc. (NHS) with a $100,000 check to help with refurbishing homes for these storm victims. Bank of America and Chase Bank made twelve vacant, foreclosed homes available to NHS, which will oversee the refurbishment. A member of Barresi's staff, Melodie Fulmer, brought the needs of the teachers to the attention of NHS. The local non-profit community organization helps individuals and families achieve the American Dream of homeownership. In the aftermath of the May 19 to June 7 tornados, floods and storms, the organization is reaching out to local teachers and school support staff who have lost their homes in an effort to help them re-establish home ownership or temporary housing until their homes are restored. "Housing is our No. 1 need right now in the aftermath of these storms," said Roland Chupik, executive director of NHS. "We are grateful to the banks for making these homes available as alternative housing for victims of these disasters. We also appreciate NeighborWorks America for contributing $100,000 to put toward the work on these homes. It is actions like these that enable us to help each other during difficult times." NHS is currently seeking contact information from interested individuals who qualify. Educators need to have registered with FEMA to qualify. To find out more information about this disaster relief program for teachers and support staff, contact, NHS Oklahoma City at (405) 231-4663. In addition to this program, the Federal Housing Administration (FHA) has the 203(h) program, available to anyone who has suffered a loss of property from a natural disaster. The program provides 100 percent financing and does not specify relocation. Click here for more information about this program.